LB Christian Kirksey on Baker Mayfield: "he comes in with a whole different swag"
CLEVELAND, OH – Everyone is getting swept up in Baker Mayfield Mania. The Browns rookie quarterback has become the talk of the NFL since taking over the starting job in Week Three. It all started during that memorable comeback win over the Jets on Thursday night, when Mayfield took the reigns for an injured Tyrod Taylor and instantly re-energized the entire team. It’s swelled over the last two weeks since head coach Hue Jackson named him the Browns full-time starter. In his first two starts, Mayfield orchestrated a 42-point offensive performance in an overtime loss to Oakland. Then put together his first 300-yard passing effort and led a game-winning overtime drive against the Ravens. His early success has fans gitty that Cleveland finally has a franchise quarterback. Mayfield’s own teammates are taking notice too. Color Browns linebacker Christian Kirksey impressed with the rookie so far. In an interview with the NFL Network show “Good Morning Football,” Tuesday, Kirksey gushed over Mayfield’s swagger. Mayfield certainly has a polarizing aura about him. It’s been on full display since the draft process began and it was on full display in Week Three when he took over for Taylor and promptly led the franchise to its first win since 2015. That unique swagger has the No. 1 overall pick already acting like a seasoned vet. 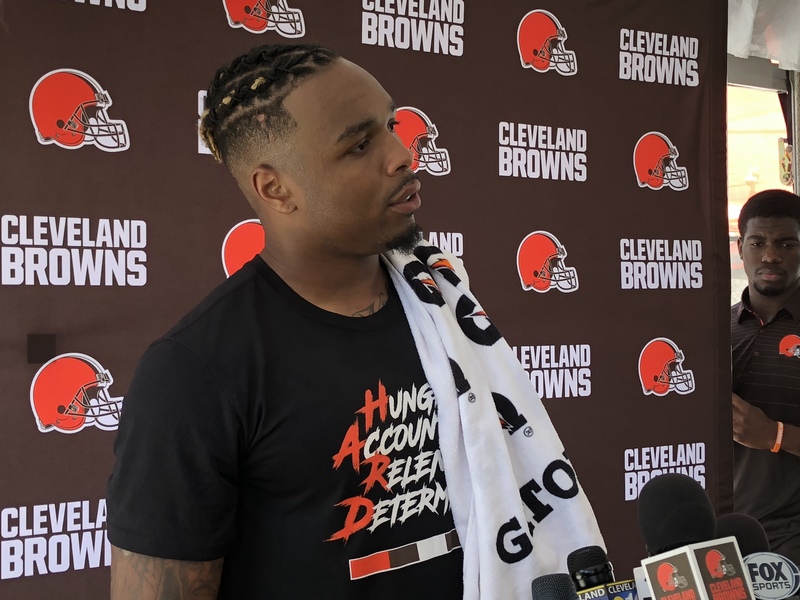 “He’ll go out there and say he messes up on one of his progressions, he’ll come back the next play like it never happened and just go out there and slingshot the ball and get it into the hands of Jarvis [Landry] or [Rashard] Higgins with a breeze” Kirksey continued. “I mean he’s talking like he’s been playing for about 10-plus years the way he carries himself on and off the field. So I think he just brings a different mentality to our offense. It’s:’next play, next play, we can do this, next play, and I think that’s what makes him so good. Fortunately for the Browns there are plenty more next plays to come from Mayfield. Check out an extended clip of Kirksey’s interview.